This casual sectional offers plenty of seating space for relaxation and conversation. Arrange the two pieces - a corner sofa and love seat - to best fit your living room, and you will be amazed by the way this sectional effortlessly fills your available space without looking intrusive. The tapered exposed wood legs, loose back pillows, and flared arms give this piece a casual look that will make it a welcoming addition to any living room. 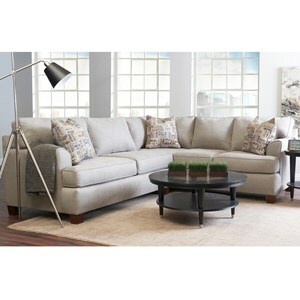 The Sparks Casual 2-Piece Sectional with Right-Facing Love Seat by Elliston Place at Morris Home in the Dayton, Cincinnati, Columbus, Ohio, Northern Kentucky area. Product availability may vary. Contact us for the most current availability on this product. Pillow One 23" x 23" accent pillow provided with the love seat; two 23" x 23" accent pillows provided with the corner sofa. 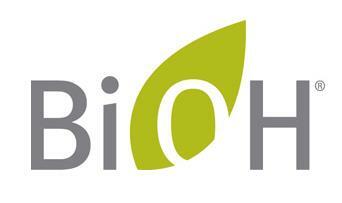 Padding & Ergonomics High resiliency foam cushions sourced partly from sustainable BIOH polyol. Inspired by the growing popularity of casual styles in the home, the Sparks sectional is composed of two pieces that can be arranged to fit your living room space to your desired taste. Built with a larger-than-average seat depth, it's perfect for accommodating a taller person, or someone who is looking to lounge comfortably using the additional space. The casual design of this piece makes it an ideal addition to your living room, and it is sure to fit in nicely with any existing decor due to its modest but inviting appearance. The Sparks collection is a great option if you are looking for Casual furniture in the Dayton, Cincinnati, Columbus, Ohio, Northern Kentucky area. Browse other items in the Sparks collection from Morris Home in the Dayton, Cincinnati, Columbus, Ohio, Northern Kentucky area.